A bear to hug, a Bible to love, and a promise to treasure: God loves you! 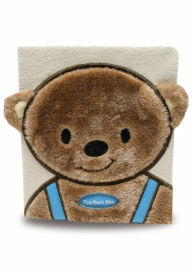 Tiny Bear’s Bible is a warm and fuzzy reminder of how God loves his children—in a format kids can cuddle. Together with their friend Tiny Bear, children discover eleven Bible stories in a book they can carry with them wherever they go. Bestselling author, Sally Lloyd-Jones presents some of the most familiar Bible stories to children, which provides parents and grandparents lots of teachable, cuddly moments as they explore God’s love together. Igor Oleynikov has been drawing since early childhood. He grew up in Lubertsy, Russia, a satellite town of Moscow where he lived with his mother, a carpet designer, and his father, an engineer. Oleynikov has illustrated more than 25 children’s books from publishers around the world. He now lives Moscow with his wife and is a proud father and grandfather. Tiny Bear's Bible Board book by Sally Lloyd-Jones is adorably cute! I love the soft little bear on the front, as does my six month old. He often holds it and snuggles with it. This is an absolutely perfect first Bible. Tiny Bear's Bible Board book by Sally Lloyd-Jones has eleven Bible stories and the illustrations beautifully match the stories. My kids love to look at the illustrations as I read to them and even my six month old seems to like to look at the pictures. My family and I absolutely love this book and it would make a wonderful gift for any young child this holiday season! You can find Tiny Bear's Bible Board book on Amazon, Barnes and Noble and other bookstores.